Earlier today, the FBI released its annual hate crimes statistics report for 2017. The data, while a vast underestimate of the violence our communities face, continues to show an increase in hate crimes for the third year in a row. The number of hate crimes reported to the FBI in 2017 went up to 7,175 from 6,121 in 2016, representing a 17% increase, a significant jump from the five percent increase between 2015 and 2016. 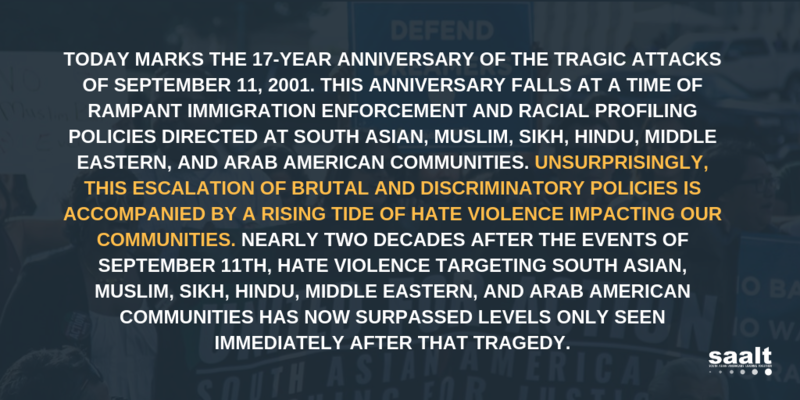 This is an alarming upward trend of hate crimes – now consistently surpassing the spike immediately after September 11, 2001. The surge in hate crimes against Sikh and Arab Americans, which rose by 243% and 100% respectively since 2016 is particularly disturbing. And, while the overall number of hate crimes targeting Muslim Americans decreased by 11%, the 2017 total of 273 anti-Muslim hate crimes continues to be a historically high number. Since November 2016, SAALT’s data on incidents of hate violence aimed at South Asian, Muslim, Sikh, Hindu, Middle Eastern, and Arab Americans show that over 80% of the documented incidents are motivated by anti-Muslim sentiment. Underreporting of hate crimes by local law enforcement agencies to the FBI remains a major problem. According to ProPublica’s “Documenting Hate” project, thousands of local law enforcement agencies choose not to report hate crimes statistics to the FBI at all; of those that do participate, 88% reported zero hate crimes in 2016 closely mirroring the 87% who reported zero hate crimes in 2017. A separate ProPublica investigation revealed that 120 federal agencies have not complied with mandates to submit hate crime data to the FBI. In fact, the FBI itself does not consistently submit the hate crimes it investigates to its own database. We echo the concern shared by our partners at the Arab American Institute, identifying glaring omissions from the 2017 hate crimes statistics. In particular, the failure to include Srinivas Kuchibhotla’s 2017 murder at the hands of a white supremacist in Olathe, Kansas. His killer, Adam Purinton, was convicted on a federal hate crimes charge earlier this year. The lack of political will on the part of the Department of Justice to collect this critical data combined with this administration’s flawed approach to understanding and addressing hate crimes makes us all less safe and places a burden of data collection on communities. Additionally, this administration’s continued refusal to acknowledge the growing problem of white supremacy ignores the primary motivation behind the violence targeting our communities. The 2017 FBI data shows that of the over 6,000 hate crimes where the race of the offender was reported, over 50% of the perpetrators were identified as white. SAALT’s data as illustrated in our 2018 report Communities on Fire report found that perpetrators of hate violence referenced President Trump, a Trump administration policy, or a Trump campaign slogan in one out of every five hate incidents documented. White supremacist violence, fanned by the flames of racist rhetoric and policies at the federal level, has devastated marginalized communities. Until this administration confronts this crisis, we will continue to face a surge in hate crimes aimed at our communities. South Asian Americans Leading Together (SAALT) joins our nation in celebrating a sea change of leadership in the House of Representatives and welcomes the prospect of significant policy changes to reflect the needs and priorities of our communities. South Asian Americans, alongside immigrant and communities of color across the country, made their voices heard last night. The message is clear – the future we want is one that preserves dignity and inclusion for all. Voters chose to reject incumbents and candidates running on anti-immigrant platforms in California, Texas, Virginia and Pennsylvania. Our work begins today to ensure every elected official commits to safeguarding the rights of all Americans, including the over five million South Asians living in the U.S. We insist on accountability and strong, principled leadership for our communities. South Asian Americans reaffirmed their role as constituents in pivotal Congressional districts. In several of the top 20 Congressional districts with the highest South Asian populations we saw unprecedented shifts – from the flip in Virginia’s 10th district where Democrat Jennifer Wexton defeated incumbent Barbara Comstock; to the election of Democrat Haley Stevens in Michigan’s 11th district, which voted for candidate Trump by a narrow margin in 2016; to Georgia’s 6th district in metro Atlanta that’s so close it hasn’t yet been called. It was also a night of firsts in notable places. In Michigan, a state with thriving and powerful Arab American communities, Rashida Tlaib became the first Palestinian American woman elected to Congress. She joins Ilhan Omar, the nation’s first Somali American elected to the House, from Minnesota. Together they are the nation’s first Muslim women elected to Congress. Finally, Sharice Davids became one of the nation’s first Native American Members of Congress, and will represent Kansas’ 3rd district, the site of Srinivas Kuchibhotla’s murder at the hands of a white supremacist. Our Midterm Election Voter Guide emphasized the importance of candidate positions on Civil Rights, Immigration, Hate Violence, and Census 2020. We ask you now to join SAALT in this next phase of holding our newly elected officials accountable to advancing and sustaining immigrant and civil rights by unequivocally rejecting an unconstitutional proposal on birthright citizenship and instead passing a clean DREAM Act; taking up the charge of confronting white supremacist hate violence targeting all of our communities; and eliminating the possibility of a citizenship question on the 2020 Census. We will continue working with you to bridge grassroots power and priorities into a policy agenda. We remain committed to keeping our communities’ priorities at the forefront of those who aspire to represent us.